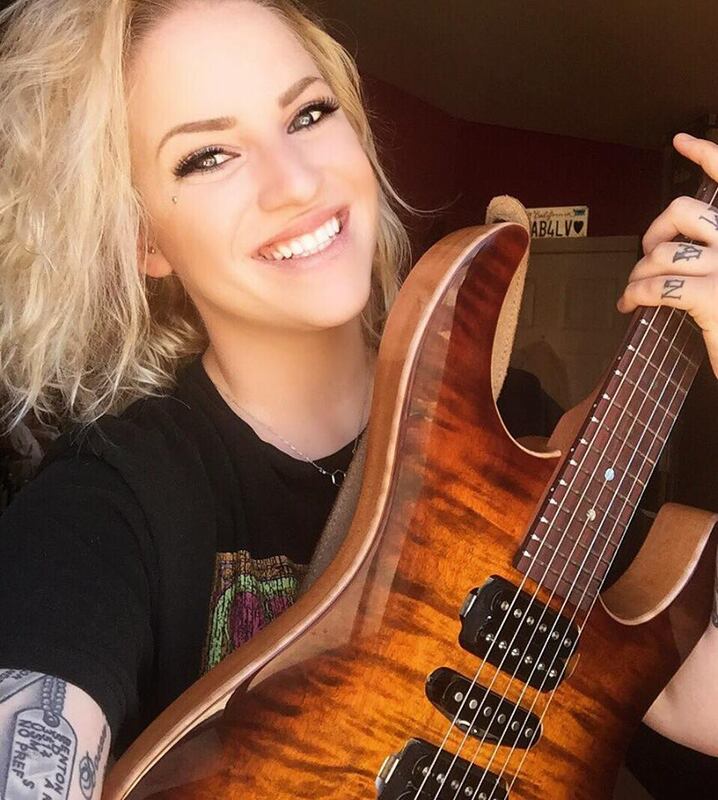 Sarah Benton From the Marines to Making Guitars Interview - Welcome To All That Shreds Magazine! From enlisting in the United States Marine Corp to being a Luthier. Sarah Benton has made quite a jump for a career. Talking with Sarah, you can tell she’s passionate about what she does. Her style stems from its own core, and this is precisely what accentuates her bringing excellence to her craft of being a Luthier. Her natural discontentment towards the ordinary trends and humdrum techniques compels her to experiment and build her magic. With her list of clients that make it out to be a who’s who in the Guitar world, Sarah has mastered her craft in a male dominated business. I recently spoke with her and talked about her career..
Tell me your background. You were in the US Marine Corp, when did you decide you wanted to be Luthier? I was born and raised in Southern California. I joined the marines straight out of high school and was in for four years. I deployed to Afghanistan from 2011 to 2012. I got out and had no idea what I wanted to do. I was in and out of community colleges and I was constantly changing my major. I started to going to a special FX makeup school in Burbank. After a year of training I realized it was more of a hobby then a career. I always knew I wanted to do something in the music industry but I thought it was too late for me to be a musician (I know total wrong mindset). I came across an ad for the guitar craft program at mi and thought it was right up my alley! My father is a hobby drummer, and my step father is a Grammy winning symphony conductor/ composer, so I grew up around music my whole life. I figured, if I couldn’t play guitar, I’ll build them! Did you have an apprenticeship while you’re in school? If so, with whom? What do you find fascinating about building stringed instruments? Well, when I got out of the marine corps I struggled with PTSD and panic disorder so building guitars, basses, etc. was therapeutic for me. When you graduated school, what was your first job? Is that the same job you’re presently in? Do you feel that your experiences in the Marines helped your attention to detail building guitars? You’re on tour with some big-name musicians such as Tony McAlpine. How did this come about? It’s all about who you know. I was offered the job by a good friend of mine who works directly with tony. It ended up being the perfect fit! Do you play guitar? If someone wanted to go to school to be a Luthier, what advice could you offer them? Last question, how is your Jason Becker guitar coming along? The Jason Becker guitar is almost finished! It was put on hold when I was on tour so the date was pushed back a little more then I wanted. I plan to have it done before the end of the year. You don’t see female guitar luthiers very often!